This month I will start with a big thank you to quite a lot of people. My first post got tremendous feedback. I had >10 000 page hits for my blog and >20 000 hits for my Youtube videos. Thank you all for paying attention. If you want to support me leave feedback and suggestions in the comments. If you have any ideas for cool experiments that migt be possible with 20 LEDs tell me. If you implement cool stuff with my shield tell me as well. I will be more than happy to post about it. One of the results of those high click counts was an automatic email by Youtube. This mail pointed out that I might make some money by adding advertisements to my videos. However I do not want to annoy any fellow tinkerers with commercials. So I did not implement this offer. If you like my work and appreciate my stance tell others about my site. In order to boost my chances to win a laser cutter give away contest I thought about doing something spectacular with the Blinkenlight shield and some laser. After all the overall background of the contest seems to be laser affine. The idea I came up with was to measure the speed of light. Or to be more precise its time of flight. Of course using a Blinkenlight shield with a setup similar to the LED camera experiment. I know that this light detection mechanism is far from optimal but I insist to do it that way just for the sake of it. I am fully aware that there are simpler means of determining the speed of light. One of them so easy to pull of that even a child with a microwave oven and a chocolate bar can determine it. See the video below for this feat. But back to my approach. My idea was to use the Arduino to pulse a laser and detect the light with my shield. That is the laser would be sitting side by side with the shield and aim at a mirror. Then I would move the mirror further and further away and measure how the time of flight increases. Sounds simple enough but there a many issues with this approach. But challenges just add to the size of the victory so lets see which obstacles I met. First the obvious obstacles. The Arduino runs at 16 MHz. Since the speed of light is about 299,792,458 m/s this implies that it will travel about 18,73m per clock cycle. Also I know that my shield is not very sensitive and picks up a lot of noise. Seems like a bad start. But others have succeeded with even worse setup. There is some experiment that even succeeded in using “ping” to measure the speed of light. The key is a technique also known as stochastic resonance. Thus in theory my setup should succeed to measure time of flight even for distances below 20m. This is great because it would not require an outdoor setup. It would only require to create lots of measurements. Excellent. So on with the next issue. I searched for some old laser pointer and tried how fast my shield could actually detect it. It turned out that it did NOT detect it all. Basically it was blind with regard to this laser pointer. After some minutes with Google I found that this is because my LEDs are orange and the laser pointer is red. With other words: the wavelength of the laser was longer than the wave length of the LEDs. In order for the LEDs to detect anything the light must have a shorter or equal wavelength than they emit. Bad news. Who cares if a laser cutter is at stake? So I clicked *bay and ordered a green laser pointer module. These things are pretty cheap nowadays. Three days later I had a new green module and alas this module’s output can be detected by my shield. The next issue is that this module wants to be fed with 3-3.6V and will draw about ~300mA. 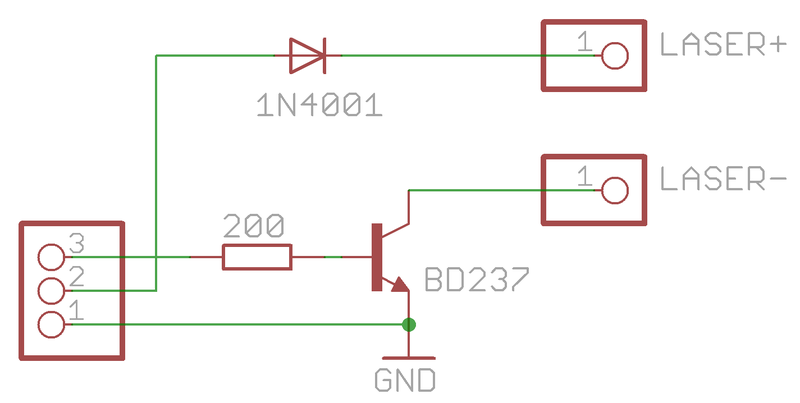 I looked up my parts bin and found some suitable transistor and slapped together the following simple driver circuit. Notice the diode. It serves the only purpose to make the whole thing suitable for 5V. This is somewhat poor design, a resistor would have been better but I did not have a suitable resistor at hand. Anyway I did not intent the circuit for continuous use but for pulsed duty. So this should be fine. Then I went to the basement to solder the whole thing. My lesson in dealing with green laser modules: if they are round they can roll of the bench, hit the concrete floor and break. This is what the module did 😦 Fortunately I was able to fix this with generous use of hot glue. See the final result below. As a first test I hooked this to an Arduino running a bouncing ball sketch. As you can see I use the old 1.1 prototype. This is because I had already soldered some headers to it thus this was the most convenient shield for connecting the module. As you can see the laser driver works fine. Then I figured that there will be some significant beam divergence and alignment issues. My idea is to compensate this by two means: 1) use a lens and 2) compensate in software. That is will measure the detection time if the laser is already on. Then I will switch of the laser, precharge the detector, turn it back on and measure the time till the detector trips. Since the laser should always take the same time to activate and since the detector should always take the same time to trip the difference should be caused by the time of flight. Of course there will be lots of “noise” but this I will tackle by stochastic means. So here is the sketch for my setup. the Timer Interrupt Mask Register (TIMSK1). TIFR1 and TIMSK1 are not shown in the figure. prescaler, see ”Timer/Counter0 and Timer/Counter1 Prescalers” on page 141. (WGM13:0) located in the Timer/Counter Control Registers A and B (TCCR1A and TCCR1B). sequences and waveform generation, see ”Modes of Operation” on page 125.
by writing a logical one to its I/O bit location. An Input Capture can be triggered by software by controlling the port of the ICP1 pin. overwritten with a new value. In this case the result of the capture will be incorrect. interrupt that automatically clears the TOV1 Flag, the timer resolution can be increased by software. ICF1 can be cleared by writing a logic one to its bit location. TOV1 is automatically cleared when the Timer/Counter1 Overflow Interrupt Vector is executed. Alternatively, TOV1 can be cleared by writing a logic one to its bit location. // Laser pin definition, Pin 19/ PORTC Pin 5 will be used to control the laser module. // identified because it is at the edge of the Arduino board. // to some pull up/down resistor or FTDI chip or anything else. TCCR1B = (1 << ICES1);   // stop timer1 but still have input capture edge detection to "rising"
Unfortunately it is not that simple. Here is some of the data that I acquired. It turns out that the whole setup is VERY temperature sensitive. All solid state lasers have protective circuitry to prevent them from burning out. As my analysis revealed this is a major obstacle for my approach. Here is a piece of the data that I captured. Here is a plot of it over time. As you can see detection time varies with run time. That is it varies with the heat build up in the laser circuit. This effect is very pronounced. It dominates any time of flight effects. At first glance it looked quite good but deeper analysis showed that the temperature dependency really dominates everything else. Basically I am stuck here. Several options come to mind: (1) get better temperature control. (2) gather way more measurements. (3) modify the laser module such that it will run at lower power but with much less sensitivity for temperature. But all of them are somewhat out of the reach for just some weekends. So here is my question for all who read my blog: what are your proposals to fix the time of flight experiment? 24 Responses to Thank You World! My idea is to measure with different distances and then to use linear regression to factor out the rise time of the laser. However right now the temperature impact is way to large. Instead of pulsing the laser on and off, perhaps you can leave it on and use a spinning disk with a narrow slot to gate the beam. That way the laser can be in a steady state condition. You will of course have to sync it somehow. Possibly by sensing a drop in reflected (off the spinning disk) laser light. For the laser, it looks like you’re using a DPSS module based on the shape and the color. Can you try a simple diode laser ~650NM? Aixiz sells them for dirt cheap online and on eBay. I’m guessing that cutting out the NLO in the DPSS and simplifying the device will improve the repeatability of your results. I’ve found that the output changes significantly based on the temperature of the optics as well as the quality of the beam. Sorry, I missed the wavelength part. You can also order blu-ray diodes (~405nm) that don’t have the messy NLO that a dpss does. This is interesting. I was completely ignoring the fact that blue lasers are NOT dpss. I already ordered a blue laser at *bay. Let’s see how far this will get me. Thanks a lot for this valuable insight! Maybe you can add a rotating mirror just before the LEDs to increase its sensitivity. I recently disassembled a Laser printer and saw a hex-sided mirror assembly that gave me the idea. In your case, the light would exit the laser, hit and reflect off of the mirror, then reflect back. It would then strike the new hex-sided mirror, and finally enter one of the LEDs. As the hex-sided mirror spins the light would enter each LED in succession, from left to right. You would adjust he motor speed so that all the LEDs are used. I can imagine the results “folding back” to multiples of the LED strip length, thus imposing a range of allowable distances. You might be able to precisely stop/position the hex-sided mirror such that the light enters a single LED continuously as to retain the current behavior. Yes, folding back to increase the length is a good idea. However this will not address the heat build up issue. I will have to resolve this first. I’ve noticed my mobile phone becomes very cold when mounted on the dash in front of the aircon vent. Could put your experiment in this position and shoot the laser out of a car window which has been rolled down. Interesting approch but unfortunately it will not solve my issue. The heat build up is inside the laser control circuit. I might be able to even this out by running the experiment for days in a temperature controlled environment. But this would defer the idea of having a “simple” setup. Do you have access to a deep freeze or at least a fridge? It offers a very cold, very dark place to run the experiment. I am afraid but a deep freeze will not keep the temperature stable. Especially not the internal temperature of the regulation circuit. Also my fridge will run periodically. Another issue is that my experiment requires probably 10-20m distance from the laser to a mirror. Again something that I can not achieve with my fridge. 1. Better Temperature control – Put it inside a polystyrene box to insulate from outside effects and leave the laser ON to acquire a thermal stability – the longer it is on the better stability – leave on for a day. Also because its in a insulating box it could keep the box at a stable temperature. Could you get arduiono to measure temp as well. 2. Yes get more measurements and use averaging to improve the measurement. 3. As mentioned if the laser is permanently ON how do you detect and measure time. If you are going to use the blinkenlight detector you need to split the array of detector LEDS in two – one set/side becomes a reference and one set becomes the measure. You then need to split the laser light coherently maybe into two fibers off different length and then measure phase difference. I am not saying that any of that was easy….but it maybe some of the way forward. Its a very good project…. 1) I will put this on my list. 2) Will also go to my list. 3) I want to detect time of flight in air. So I rather would not use fibers. Anyway phase difference is not what I am looking for as the wavelength of visible light is rather short. Ok, understand step 3 is not what you need. Out of interest, How far apart is the Laser and the blinken light detector? Seems that wordpress does not allow me to answer your reply below. So here is my answer above 😉 I intend to vary the distance and then to apply linear regression techniques. That way I want to get rid of the (hopefully constant) latency and only determine the linear term that depends on the distance. Thus I want to infer the actual time of fligh per meter. That’s interesting the way you are going to remove the launch delay on the light pulse. I had some thought about how you could remove the pulse launch delay. I thought you could have had some trigger line.A trigger line that left the arduino and came back to it and which was the same cable length of the arduino to the laser. You are still left with some laser ON latency but it is reduced. Are you going to be perform the measurement in the dark to stop the LED detector from being polluted by surrounding light? Actually I will not do this in the dark. 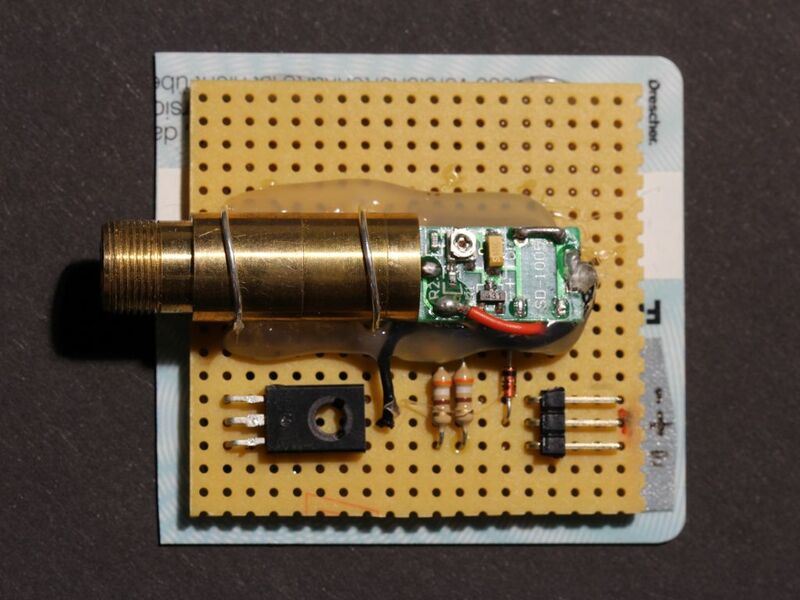 Either I will use red light (which is not picked up by the sensor) or I will put the sensor in a dark tube. This should be sufficient. The latency is not an issue because I will measure different distances. Thus by means of correlation I should be able to remove the latency from the equation. The hard part is getting an accurate/stable 50MHz clock. Maybe if you use a semi reflectant mirror you just have to measure the time between the first and the second signal, you will be independent of the start time. Sorry for my english. I love your project. Right now the TOFL experiment is somewhat on hold. Once I continue I will consider this.